Beyond aiding in allocation of student activities funds, SGA serves in a school-enhancing capacity, community involvement capacity, a forum to meet new students, a place to develop leadership skills and much more. GSGA participates in many school-wide events ranging from participating in Campus Community Open House to running local blood drives on all of our campuses. Members of the Georgia Student Government Association (GSGA) also get to participate in off-site leadership conferences and workshops. SGA is committed to supporting our local communities. It is our civic responsibility to give to those less fortunate. GSGA Positions Requiring Campaigning: all slated positions. Slated positions are listed below. Note: slated positions will be determined at GSGA retreat after the installation ceremony. General Members – just fill out an application and we’ll let you know about the meetings! No campaigning required! Organization representatives will be appointed by your student organization! No campaigning required! 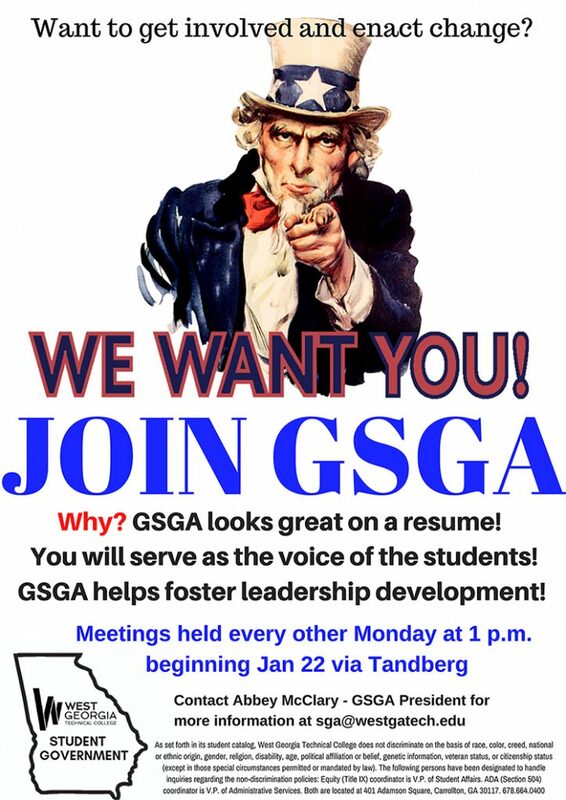 All SGA meetings usually take place every other week around lunchtime on each campus in the Boardroom and use the Tandberg (video chat) communication to hold meetings. Dates for meetings are TBD and will be established when the new EC has been installed. Two All GSGA retreats will take place this year as well! IF YOU ARE RUNNING FOR A CAMPAIGNING POSITION, PLEASE ATTEND THE GSGA CAMPAIGN MEETING IN THE TANBERG BOARDROOM ON YOUR CAMPUS – APRIL 10 – 12-1 p.m.